A globe is a map on a spherical shape. You'd think it's easy to accurately translate flat maps onto a sphere but it's not. A flat surface does not perfectly fit a curved surface. There will be distortions on the map. A flat map will not perfectly fit a round surface. The difference between a flat surface and a curved surface means drawing a map on paper and transfering it to a globe require compromises and no compromise is perfect. These compromises are ways of drawing the map on paper. These drawing methods are called projections. Depending on what you wish to emphasize (whether land masses or oceans) there is a particular projection suitable. The most popular projection is probably the Mercator Projection, popularized by Gerhard Kremer (aka 'Gerardus Mercator') in the sixteenth century. You can find other popular mapping projections from Carlos A. Furuti's site. Maps (even of other planets) to be projected on a globe differ from the regular maps you see in that they are interrupted — not continuous. Interrupted maps appear like flattened packaging ready to be cut and bent into shape. Some look life leaf cutouts, some look like flower petals. Not all interrupted maps (projections) are as regularly interrupted like a flower. The newest ones, called myriahedral projections can have any shape and have many many lobes (hence the root word 'myriad'). 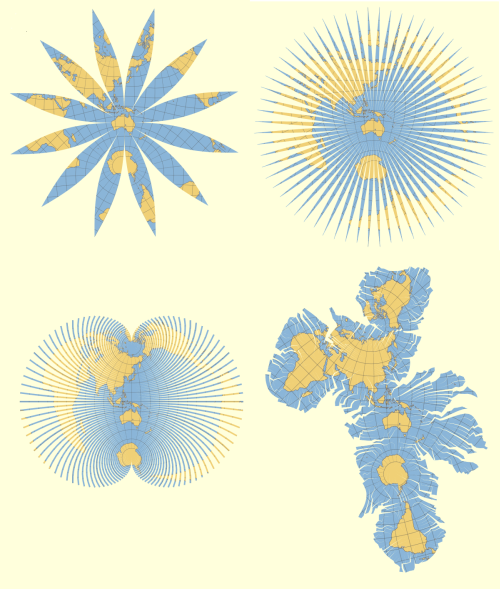 Though offering less distortions, myriahedral projection maps are probably impractical for producing globes because of the vast number of usually irregularly shaped lobes. The most practicable ones (the ones easiest to mold onto a globe) have regular lobes (regular lobes are also called 'gores'). For globes, this takes the form of a flower-like (pinwheel-like) map for each of the hemispheres. The flower-petal like map is very easy to turn into globes using machines in an assembly-line. A pin-wheel/flower map for globes is usually drawn using a popular projection (or a combination of popular projections), now usually constructed using sophisticated map-drawing software. Non-Earth globes are also made using a pinwheel map. The U.S. Geological Survey's maps for Mars and Jupiter's moon, Europa, for example, used a combination of Transverse Mercator projection and Lambert Azimuthal Equal-Area projection. 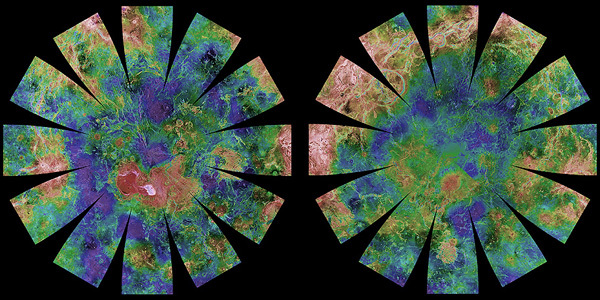 Venus for globes (from the USGS Astrogeology Science Center). Once you have the flower-petal map for both hemispheres, you need to transfer these to suitable heat-moldable materials for globes. The most common material is cardboard, although plastic, metal, and other materials are also suitable. Once the maps are transferred to a suitable material, they are then cut and then molded into shape. Then the hemispheres are stuck together (with glue or heat) and assembled with their frame (or meridian) on which the globe will turn. The actual process is much more detailed of course, and widely differ, depending on the type of globe being produced. After that, you’ll realize that globe-making is science and art combined by passion. What’s All the Fuss Over Gemstone Globes? Why do many people have globes in their office?